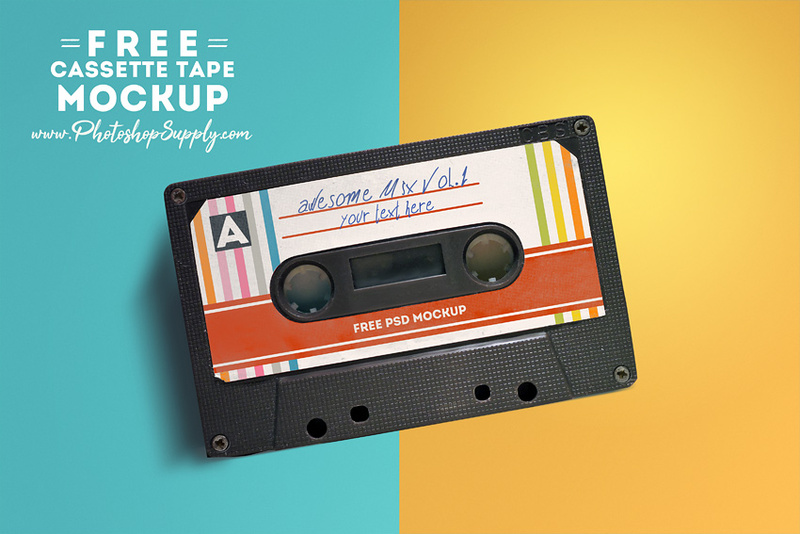 Download the free cassette tape mockup and customize it to your liking. The cassette tape comes in a fully layered psd file. If you are looking for a retro tape mockup, look no more! You can download for free this cool retro cassette. You get a fully layered psd file, grouped and well organized. The size of the canvas is 4200x2800px. You can edit the smart object and add your own design. All the elements are editable. You can edit the text, change the color of the text, choose another font type, etc. For the cassette label I used a free font called Biffe’s Calligraphy font. The background is in separate layer. So, you can change its color or replace it with another background. As you can see in the previews you can design your own cassette tape label using retro stripes or other retro patterns. Create endless results with this awesome cassette tape mockup. The color of the audio tape is black. The screws are in a separate layer so you can hide them. Create your own customized music tape with this creative mockup. If you need a music mockup with a vintage look you can try our freebie. 2019 © Photoshop Supply. Crafted with love by SiteOrigin. Want to receive more Photoshop freebies?